Creating a lush, immaculate lawn from seed isn’t as easy as it sounds, but with these handy tips you can soon establish an impressive green expanse that not only looks great, but can also increase the value of your home. A dense, healthy lawn stabilises the soil, absorbs rainwater, reduces soil erosion and helps settle airborne dust (in the US, it’s estimated that grasses trap up to 12 million tons of dust and dirt annually). Grass cleans the air by absorbing carbon dioxide, and the lawn around your home can also reduce noise levels by around 20-30 per cent when compared to harder surfaces like concrete. Having lawn around your home makes it harder for burglars to approach undetected (they love dense shrubbery up against your windows for concealment). Having a stretch of lawn between your home and large trees can reduce protect your house from falling limbs in a storm – and reduce issues with tree roots invading your underground pipes. If you have children but no lawn or handy park nearby, it can be hard to give young people the ‘running around’ time they need. 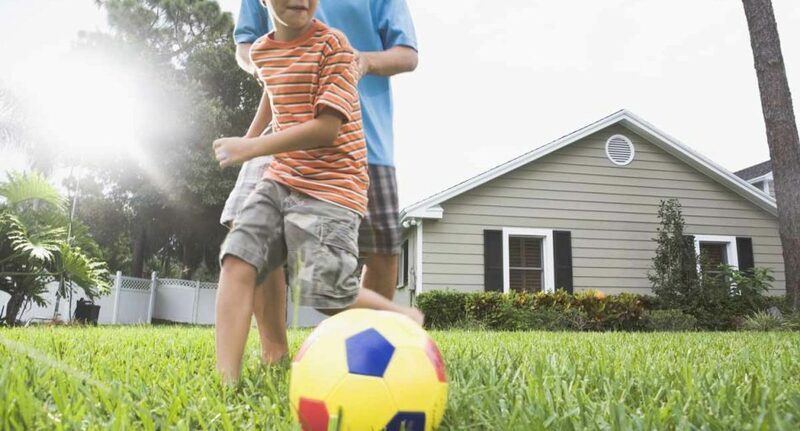 A green space is ideal for backyard cricket, football tossing, weekend barbecues and summer fun. A manicured lawn enhances the look and feel of your home by adding a sense of order, tidiness and elegance. It can also provide a major boost to the overall value of your property. According to a 2012 study commissioned by Turf Australia, a lawn adds up to $75,688 in average value to a property. In Queensland, this specifically equated to an extra $48,600 added to a $405,000 home – or an added 12% in value. The same study also found that 80 per cent of us prefer a lawn that takes up around a third of our total property size. Spring is a great time to plant a new lawn from seed in most parts of Australia, because the weather is mild and the grass has time to become established under optimum conditions. Ideally, you should sow seed when temperatures are neither too cold nor too hot. Spring is a great time to plant a new lawn from seed in most parts of Australia, because the weather is mild and the grass has time to become established under optimum conditions. Sowing when it’s too chilly makes it hard for grass to form an actively growing root system, and growing a lawn in scorching weather puts too much stress on the grass and creates higher water demands. If you live in a cooler part of Australia, you may want to wait until the middle of spring to start your lawn. The perfect time to grow a new lawn from seed will depend on your location within Australia, so seek expert advice from your local plant nursery. This grass loves heat, humidity and lots of sun. It’s a good choice when you need an ultra-durable, fast-growing grass, but it can be invasive. Kikuyu grows well in poor soils. Durable, affordable and low-maintenance, couch grass creates a soft, fine leaf lawn when carefully mowed and regularly fertilised. Thanks to its vigorous underground runners, it repairs itself quickly. Distinguished by its wide leaf blade, Buffalo grass is available in soft leaf varieties including Matilda, Sapphire and Palmetto, which all provide a lush lawn that’s robust and easy to maintain. This warm season grass is salt-tolerant, drought resistant and loves the heat. It doesn’t need a lot of mowing or fertilising and looks terrific all year. It can take a fair bit of abuse and recovers rapidly. Okay, it’s not technically a couch grass and it’s not from Queensland, either, but this grass is a great all-rounder for a home lawn. It keeps its green colour most of the year and isn’t as invasive as other grass types. It is intolerant to weed sprays, however . Creating an attractive lawn means not skipping steps. Firstly, think about how easy it will be to mow. In trickier corner areas of your yard, you might want to consider landscaping with plants instead. Once you’ve decided where the new grass will go, you need to prepare the soil. Your goal is a firm, weed-free, well-drained soil that’s clear of rocks, rubble and clay lumps. You’ll need to dig the soil at least 15cm deep and turn it over thoroughly. Ensure you’ve killed off all the weeds before sowing grass seed. Water the soil well and then leave it for 2-3 weeks. Check for weed seedlings again before sowing. Security tip: keep your garden tools in a locked garage or shed. Burglars love it when homeowners leave ladders, crowbars and hammers within reach – it makes it so much easier for them to break in. Make sure your contents insurance is up to date as well. Check the level of the proposed area in respect to proper drainage. After a rain, you don’t want any water gathering in puddles. A poorly drained lawn attracts water-loving weeds and mosses, which are hard to get rid of once they take hold. Level off uneven areas by raking or by attaching a heavy piece of board to a rope and dragging it across the turned soil. On a slope you might be better off laying turf instead of trying your luck with seed, since a good downpour can wash your grass seeds down the hill and away. If your soil isn’t the best, you may need to apply gypsum to boost water penetration and improve soil structure. Invest in a pH soil test kit to check acidity levels: you may need to add lime to the soil. This adds calcium and magnesium and corrects acidity. Once your soil is ready, rake it in straight lines, creating shallow furrows. To encourage germination, spread a lawn-starter fertiliser at the prescribed rate. Then, separate your grass seed into two equal amounts. Spread the first batch in one direction and the second at right angles to the first. This gives you a more even distribution. Once the seeds are down, cover them by lightly raking the surface of the soil. Water the area twice a day with fine mist spray until the seedlings have taken hold. Keep all foot traffic away from the area until full germination. Your seeded lawn should take about eight weeks to establish. The best advice for watering new grass seed is simple. Since you only get one chance to germinate seeds correctly. The right amount is very important. Not enough water will kill the sprout and too much water can leave less than ideal results. The right amount of watering is very important. Not enough water will kill the sprout and too much water can leave less than ideal results. All grass types need to be kept moist at all times during their establishment phase, this is to ensure there is always an ample amount of moisture in the soil. This ensures the greatest, and only chance of survival and establishment of the new grass seedlings. Like your body, your car and your relationships, your lawn requires a certain amount of maintenance to keep it ticking along. Use correctly balanced lawn fertiliser during the active growing season and remember that frequent light fertilising is always better than a heavy, once-in-a-blue-moon approach. Don’t be tempted to cut a newly seeded lawn too soon. The rule for a healthy lawn is to mow frequently and not too deeply. Many people cut their grass way too low, completely scalping the leaf blades that are essential to the health of the plant. Don’t be tempted to cut a newly seeded lawn too soon, but once your lawn is established, it can be cut to 2.5cm for warm season grasses and 4cm for cold season grasses. The rule for a healthy lawn is to mow frequently and not too deeply. Check the water restrictions in your area so you’re not doing the wrong thing when it comes to watering your lawn. The key to effective lawn watering is to water in the morning and provide deep, thorough and occasional soakings rather than a lot of quick sprays that don’t reach the roots.